There’s nothing like a good breakfast to get you out of bed. Today’s breakfast in bed is a peanut butter oats and Chia seed pudding topped with walnut, bananas, and a sprinkle of more Chia seeds. If you’re a peanut butter or bonoffee pie fan–this healthy pudding is for you! These corn tortillas are loaded with scrambled eggs seasoned with paprika, oregano and cumin. Added some avocado, crumbled feta loads of jalepeños 🌋🌋 yumm! I know…I know…before you think I’m crazy for making a watermelon pizza, bear with me, please. I found myself unexpectedly home for the week and decided to seize the opportunity and teach my younger siblings all about healthy eating. This recipe was the perfect way to introduce healthy eating to them. I feel like Ramadan is the perfect time to teach them about clean eating–all the fruits were a wonderful way to keep them hydrated while getting some extra fiber in their little bodies. It was so much fun to make and it looked and tasted absolutely gorgeous. 1- Go to your local grocer and buy yourself a nice and plump watermelon. 2- Cut the watermelon in half. 3- Cut one slice off the top of one of the watermelon halves. 4- Cut the slice of watermelon into 8 slices (pie style). 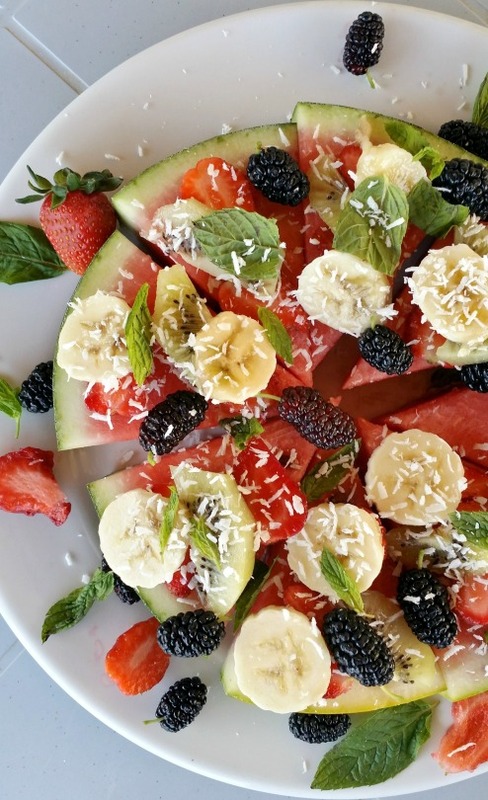 5- Layer the “pizza slices” with sliced bananas, kiwi, strawberries, goji berries, blackberries and sprinkle with mint leaves and shredded coconut. The good thing about this recipe is that you can pimp it up or down depending on what ingredients you’ve got lying around. You can drizzle on some rose water, honey, or balsamic vinegar. You can even sprinkle on some nuts! You could literally put whatever you feel like putting on it! My parents had some berries in the backyard and that’s why I put some on. It’s totally up to you! Who says healthy eating has to be boring and can’t involve your kids, right? Go straight-up bananas with me and give this recipe a go and tell me what you think! I’m still in denial that the long-awaited long Easter weekend is over. In fact, I’m in denial that I’m at work typing away on my laptop. This is all a figment of your imagination, banana head. Over the weekend I did some serious cooking (and eating) catching up. A crazy week at work called for the ultimate chillaxing weekend with maximum food action. And boy, was that chillaxing weekend with maximum food action achieved! KA-BAM! I give you the roasted coconut and kale salad, ladies and gentlemen. Delicious, quick, and oh so healthy! First, preheat your oven to about 150 C.
Then, rip up the kale and place in a bowl with coconut oil, soy sauce, and shredded coconut. Mix well. Massage the oil into the kale leaves. Place kale and coconut mixture on a tray and put in oven. Let those chill there for about 12 minutes, making sure you toss twice. In the meantime, toss the egg, tomato, mango, and coriander in a bowl. 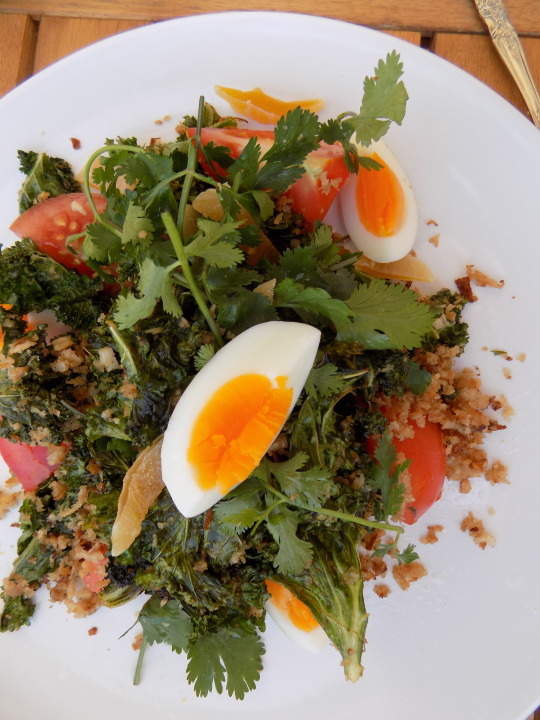 Once the kale leaves are all dried up and the coconut has gone a dark golden brown add the mixture to the egg, tomato, mango, and coriander. For the dressing, grate a tiny bit of ginger and a splash of lemon juice and dress the salad. Voila! You’ve got a delicious, healthy, and easy Thai salad on the table! I served this salad with a coconut milk curried chicken breast and Thai coconut milk soup. I’ll post the recipes soon! Go straight-up bananas with me and give this recipe a shot! I’d love to hear from you! Oh..and add me on Instagram too! Can’t think of a quick, easy, and healthy recipe for lunch time? I’m having a spinach, water cress, beetroot, carrot, and tuna salad for lunch! What about you?